What do you think about Basket Bunch bundle? To be honest - I saw it first as an Ester only stamp set/framelits with some cutesy images. But after seeing few samples at last onstage and online I changed my mind (no surprise, it happens all the time, right?). I decided to hold a class around this bundle. We all agreed this bundle is amazing and can be used for many occasions. Will this card be a great Thank you? This one is a little 'Eastery' but this is a time of the year. Stay tuned for more posts with this bundle. Copyright © 2003-2017 - All Images Copyright Stampin Up! As an independent Stampin' Up! 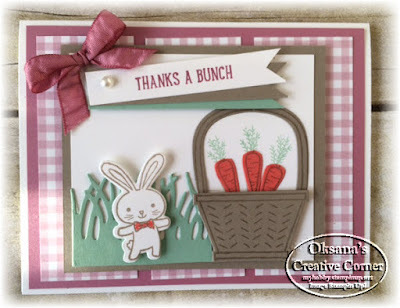 demonstrator, all of the content on this blog is my sole responsibility and the use of and content of the classes, services, or products offered is not endorsed by Stampin Up!